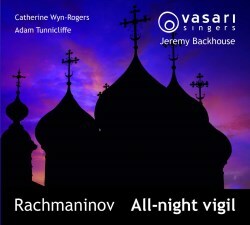 It’s not long ago that I reviewed a very impressive recording of Rachmaninov’s All-Night Vigil by the American choir, Gloriae Dei Cantores, augmented by members of some other choirs. Now, to mark the sixtieth birthday of their conductor, Jeremy Backhouse, the British ensemble, Vasari Singers has recorded it. The Vasari recording offers a very different listening experience to the Gloriae Dei Cantores disc for a couple of reasons. In the first place the Vasari line-up is smaller than the American choir: the British choir numbers 42 (15/9/8/10) while the American team has 75 singers (19/19/15/22). It will be noted, in particular, that the American bass line is significantly larger; not only that, it includes seven Octavists, those especially deep-toned basso profundo singers. If the Vasaris have any such singers in their ranks they’re not specified. In addition, the sound of the two recordings is very different The American choir is presented at something of a distance and in a resonant acoustic. In my review I commented that I had the sense that the choir was positioned in the sanctuary of the church and that I was listening from one of the front rows of pews. By contrast, the Vasari Singers are much closer to the listener; the sound is more “up-front”. Comparative listening suggests that the American recording is conceived as more of a liturgical experience whereas the British recording offers more of a concert hall perspective. There’s nothing wrong with that: David Bray reminds us in his notes that the premiere of the work was a concert performance. This is a good point to mention Mr Bray’s notes in case they should be overlooked. The notes are very fine indeed. As well as discussing the music, movement by movement, David Bray outlines what happens during the Orthodox liturgy and at what point each movement of Rachmaninov’s work would be sung liturgically. In this way the listener is enabled to picture the music in context. So interesting and helpful did I find these notes that it set me thinking how fascinating it would be if someone were to produce a video of the All-Night Vigil being sung liturgically. Does such a video exist? Jeremy Backhouse generally adopts a slightly less spacious approach to the music than does Peter Jermihov, who conducts the Gloriae Dei Cantores recording. Though I was mightily impressed – and moved – by Jermihov’s conception of the music I find Backhouse convincing too, albeit in different ways. The Vasari performance gets off to an impressive start in ‘Come, let us worship’. (I will use the English titles of the movements.) True, the choral sound lacks the bass richness of Jermihov’s choir, though the Vasari basses still give a good account of themselves. The soprano line is more prominent in the Vasari performance of the work as a whole, as you’d expect given the dispositions of the two choirs, but the Vasari Singers are a well-balanced ensemble and the commitment of their singing shines through from the Vigil’s start to its finish. The tempo that Jeremy Backhouse adopts in this opening movement ensures that his performance has a spring in its step. The Vasari recording has the luxury of Catherine Wyn-Rogers to sing the alto solo in ‘Bless the Lord, O my soul’. I greatly admire this fine singer and she doesn’t disappoint here, singing expressively and with full, round tone. She may not have the authentic timbre of a singer like Mariya Berezovska on the Jermihov recording but Miss Wyn-Rogers is not outshone. However, it has to be said that in the closing bars the soft, low basses in the Jermihov performance – they have to descend to a bottom C – definitely have more presence, and not, I think, simply because there are more of them. The Vasasris have a guest tenor soloist too: the Canadian singer, Adam Tunnicliffe. The tenor line in the ‘Nunc dimittis’ is a taxing one. Tunnicliffe does well, singing ardently. However, for my taste he’s recorded much too closely and therefore his solo line is even more prominent than it should be. On the Jermihov recording the music is treated more expansively – to its benefit – and the solo tenor, Dmitry Ivanchenko is very impressive. I think it helps that he’s not as closely recorded but Ivanchenko seems much better equipped than Tunnicliffe when it comes to floating the line. At the end of the movement there’s the famous moment when the basses have to descend softly to a bottom B flat. The Vasari basses accomplish this well but Jermihov’s basses, Octavists and all, are in a different league Their B flat is soft, firm and utterly secure. ‘Rejoice, O Virgin’, another of the work’s most celebrated movements, is beautifully poised in the Vasari performance. The lines are expertly sustained and the climax is very well done. In the following movement, ‘Glory to God’ the bell-like chords for both sopranos and tenors really sound like chimes in the Vasari performance. Their delivery of ‘Praise the name of the Lord’ is exultant and strongly rhythmic while in the following movement, ‘Blessed art Thou, O Lord’ Backhouse gets highly impressive dynamic contrasts from his choir and near the end the ‘Alleluias’ seem to tumble over each other excitedly. With the eleventh movement, the Magnificat, we experience the greatest contrast between Backhouse and Jermihov. The latter gives one of the most spacious accounts I have encountered, taking 10:24. Backhouse is significantly swifter, taking 7:45. I think both approaches are of a piece with the respective conductors’ views of the music as a whole: Jermihov is slow and prayerful while Backhouse invests the music with more vitality. The next movement, ‘Glory to God in the highest’ is the most complex and musically rich in the work. Rachmaninov here composed a real choral tour de force. The Vasari Singers negotiate the challenges of the movement very successfully. They close their performance with an exciting and committed account of ‘To thee, victorious leader’. This is a short yet triumphant paean of praise and the Vasari Singers rise to the occasion. Jeremy Backhouse comments in the booklet that the Vasari Singers, which he has conducted since its foundation nearly 40 years ago, have had the All-Night Vigil in their repertoire for quite some time. That shows in this performance which is accomplished and assured. It’s a fine way for the choir to celebrate their conductor’s sixtieth birthday.